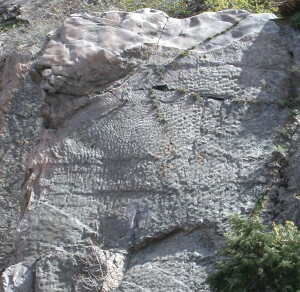 Ripple marks preserved in the quartzite about 1½ miles up Big Cottonwood Canyon. Igneous, metamorphic, and sedimentary rock types are well-represented in Wasatch Front canyons. 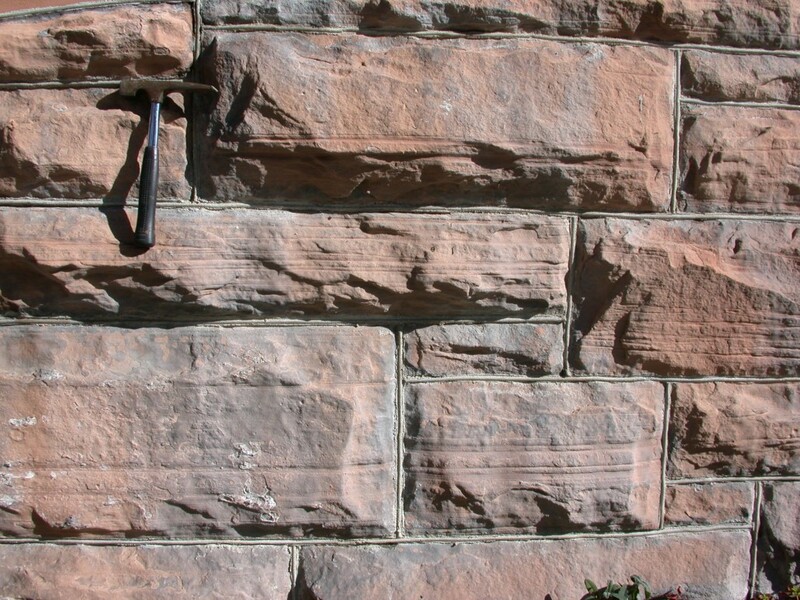 The purpose of this article is to direct teachers to locations where examples of the rock types can be seen. Little Cottonwood, Big Cottonwood, Parleys, Emigration, and Farmington canyons were selected because sites are within a short walking distance from bus or car parking. Selected rocks in these canyons include: (1) igneous rocks: quartz monzonite, (2) metamorphic rocks: quartzite, slate, gneiss, and marble, and (3) sedimentary rocks: shale, limestone, sandstone, siltstone, and conglomerate. 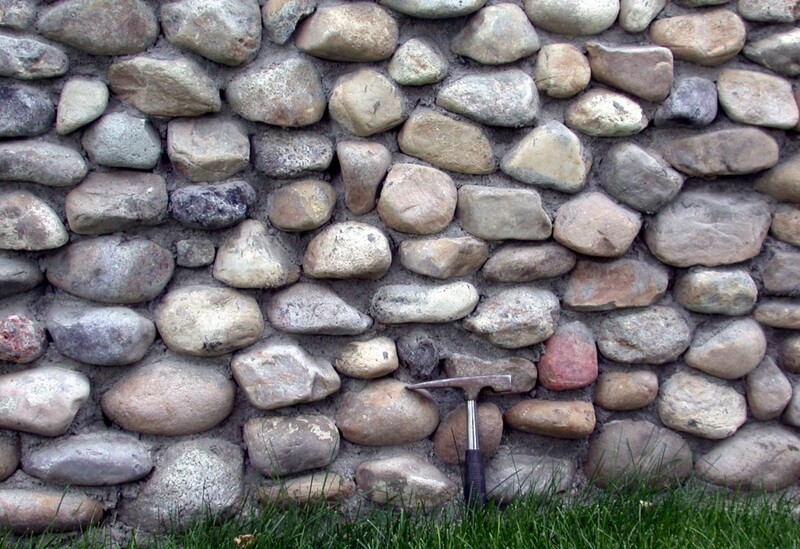 The age of the rocks ranges from about 3 billion to 24 million years old (Hintze, 1988). Quartz Monzonite: Quartz monzonite, a very close relative of, and locally known as “granite”, is a gray, “salt and pepper” igneous rock exposed in the lower reaches of Little Cottonwood Canyon. It is exposed on the Temple Quarry Nature Trail on the south side of Little Cottonwood Road (SR 209) near the mouth of Little Cottonwood Canyon. The quartz monzonite intruded into the Wasatch Range between 24 and 31 million years ago (Hintze, 1988). Slate and Quartzite: Slates and quartzites are exposed in lower Big Cottonwood canyon at the geologic road sign “Storm Mountain Quartzites”, about 3 miles from the mouth of the canyon. 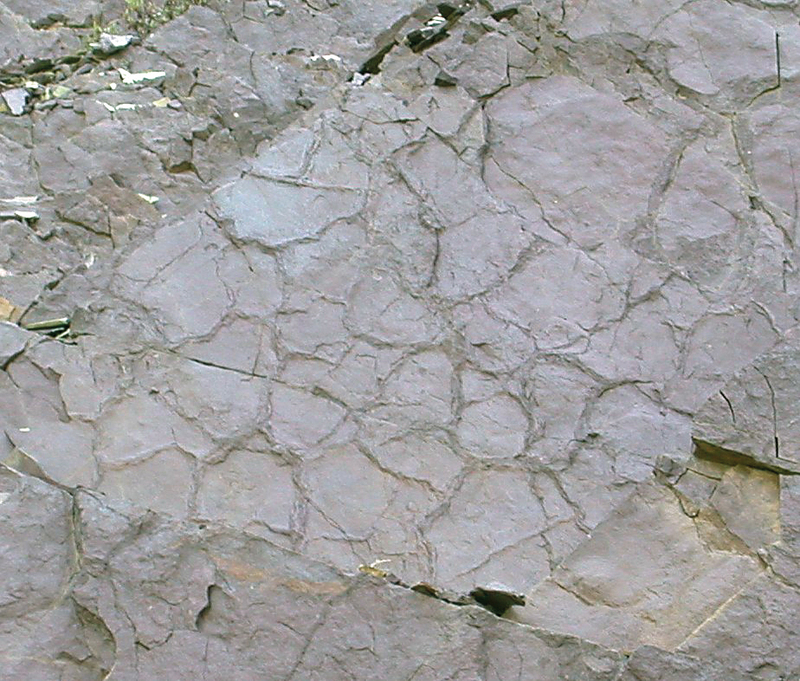 The black slates and “rusted”quartzites are part of the Big Cottonwood Formation, and are about 900 million years old (Hintze, 1988). Marble: Seven miles from the mouth of the canyon, white marble intruded by dark diorite exposed in a road cut on the north side of the canyon. The geologic road signs, “Blind Miner”, “Mississippian Marble”, “Big Cottonwood Mining District”, are in the turnoff area across from the outcrop. The sign indicates that the marble is a metamorphosed Mississippian-age (360-320 million years) limestone. 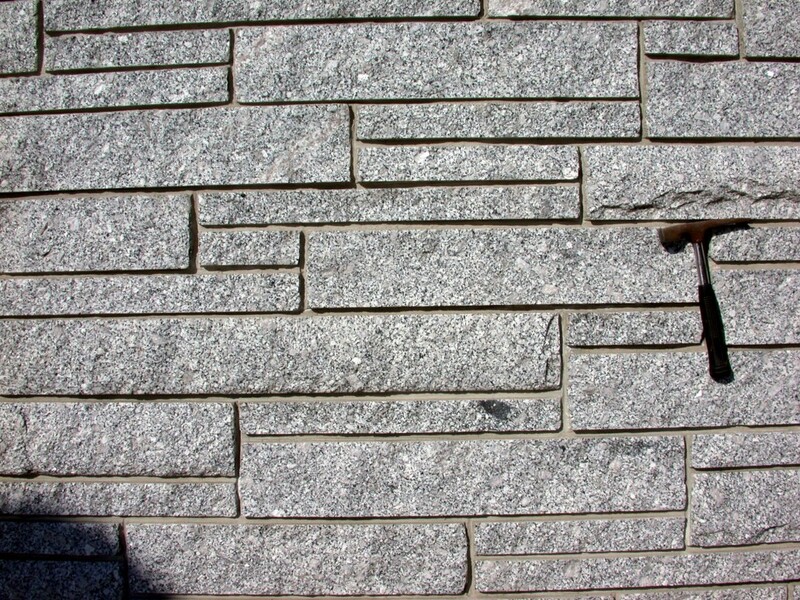 The diorite is 72.4 million years old (James, 1979). Gneiss: A gneiss that may be as much as 3 billion years old is exposed at the north end of the bridge, where 300 East becomes Skyline Drive in northern Farmington City. 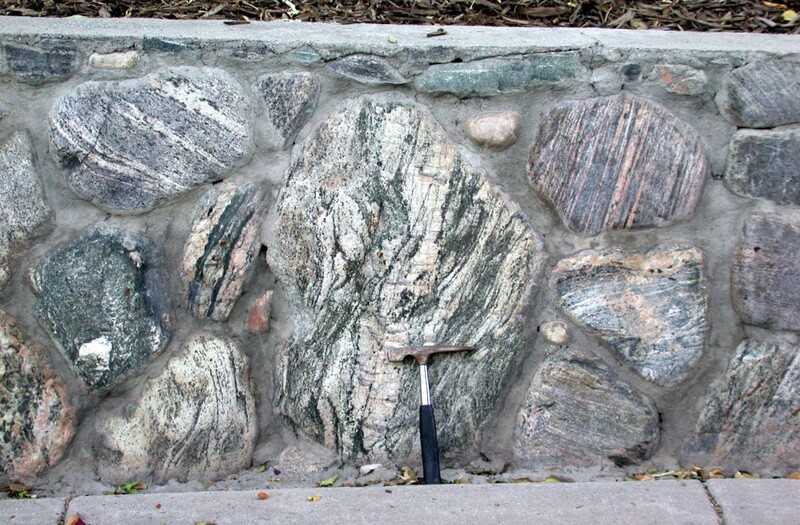 The gneiss has dark schistose (lots of mica) and light gneissose (quartz and feldspars) layers. The gneiss is part of the Farmington Canyon Complex. Limestone, Sandstone, Siltstone, and Shale: A short (just less than one mile) walk on uneven but level ground that used to be the I-80/Foothill Drive off-ramp leads to an outcrop of limestone, sandstone, siltstone, and shale on the north side of the mouth of Parleys Canyon. Walking south, the rocks appear in sequence as gray limestone, orange sandstone, and red siltstone and red shale. The limestone is part of the Jurassic (208-163 million years) Twin Creek Limestone Formation, the sandstone is the Jurassic Nugget Sandstone Formation, and the siltstone and shale make up the upper member of the Triassic (245 – 208 million years) Ankareh Formation. Conglomerate: A beautiful red conglomerate with clasts up to cobble size crops out near the junction of the Emigration Canyon road and the road to Pinecrest in Emigration Canyon. The conglomerate is the Cretaceous (144-66.4 million years) Kelvin Formation. James, L.P., 1979, Geology, ore deposits, and history of the Big Cottonwood Mining District, Salt Lake County, Utah: Utah Geological and Mineral Survey Bulletin 114, 4 pl., 98 p.